At a press event in San Francisco this morning, Google announced that it will soon feature far better 3D maps in Google Earth. The company also announced that Google Maps for mobile will soon feature offline caching. This feature will come to Google Maps to Android soon. Google says it wants to bring this feature to all platforms in the long run. Users will be able to download parts of a map to their devices and then use them when they are offline. The company also announced that its Street View cars have now driven 5 million miles and collected 20 petabytes worth of imagery data. Google also announced that it is bringing Map Maker to South Africa and Egypt today. Google’s engineering director for Street View, Luc Vincent also announced that the company has now managed to put the hardware that Google uses to capture its Street View data into a backpack called the Street View Trekker. 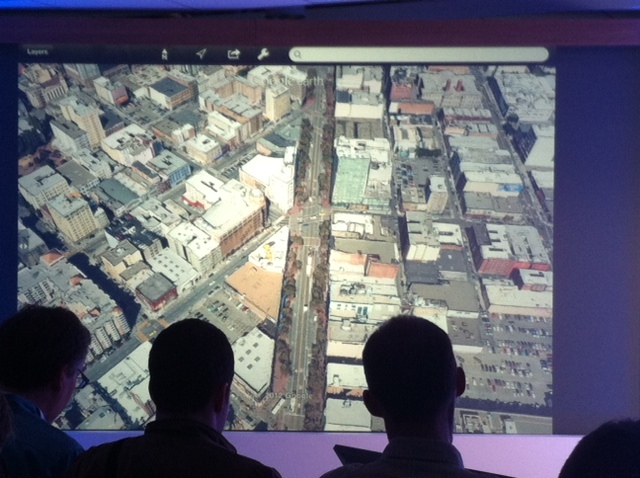 Google’s Peter Birch noted that it’s taken Google a while to go from basic 3D maps to adding buildings to its maps. One issue Google faced by 2008 was that its 3D data was coming from a wide variety of sources. “We knew we wanted to do something better,” said Birch. To model the world in 3D, the company will now use the 45-degree aerial images it already gathers from planes. Thanks to new imagery rendering techniques and advances in computer vision, Google can now retire its old 3D view in Google Earth and replace it with these new images. The result, which Google demoed today, is nothing short of spectacular. These new features will come to Android and iOS devices. Google expects this new technology will cover “communities of over 300 million people” by the end of the year. Google doesn’t want to say when these features will become available, making it pretty obvious that today’s announcement is meant to preempt Apple’s rumored announcements next week. Talking about the history of Street View, Vincent noted that Google’s earliest vans worked (Google didn’t use cars back then) but weren’t very good. The company now uses a fleet of cars and trikes (and even a snowmobile) to collect its street level imagery. Now, however, with the backpack, Google will be able to add data from a far wider range of locations. Starting the event, Google’s Brian McClendon, a VP of engineering for Google Maps, noted how far we’ve come since the early days of Silicon Graphics machines in the 1990s, which once upon a time allowed its users to see a 3D view of the world for the first time. Not until 2001, when Keyhole launched, met with CNN in 2003 and made it onto the big screen did this kind of technology really become available to the public. Google, of course, bought Keyhole in 2004 (after just 24 hours of deliberation). At the same time Google bought Keyhole – which then became Google Earth – the company was also working on Google Maps. According to McClendon, Google always had a fetish for comprehensiveness and even though the first versions of Google Maps missed many countries, it quickly added data from as many providers as it could find. In 2006, after launching Google Earth, the company now had more imagery data and now 75% of the Earth is covered in high resolution by Google Earth. Street View is now available in many countries and on every continent, including Antarctica. Google, with its Ground Truth program, also started building its own maps over the last few years and now uses street signs from its Street View cars and adds this data to its maps and directions. As for making sure its data is accurate, McClendon noted that this is often still a hard problem. Even basic plate tectonics can often lead to misalignments between different data sets. Here, too, Google uses its Street View data to extract business data and human operators to ensure its data is correct. The company, of course, also uses its Map Maker program to let users edit maps. South Africa and Egypt. It’s bringing this program to 10 more countries, including New Zealand and Australia in a few weeks. Google’s engineering manager for Google Maps for Good Rebecca Moore also talked about how Google Maps can be used by non-profits and during humanitarian crises. Google started this program after Hurricane Katrina hit New Orleans. Google, for example, helped a tribe in the Amazon to map its territory to preserve its culture by, for example, putting the location of the tribe’s battles on its maps. Starting today, the Halo Trust, which is dedicated to eliminating land mines around the world, will also start using Google Maps to show which areas have been cleared of mines and which are still too dangerous. The company’s invitation to the event promised that Google would unveil “the next dimension of Google Maps.” Apple, of course, is widely rumored to be in the process of replacing Google Maps in its iOS mapping apps with its own service. Rumor has it that these new maps from Apple will feature a prominent 3D mode, but for the time being, these are obviously just rumors. The timing of Google’s announcement today, however, was likely not coincidental and the date was probably set to preempt Apple’s announcement next week. Asked about this during today’s event, McClendon noted that Google is very proud of Google Maps and that it will continue to make it available on as many devices as possible.